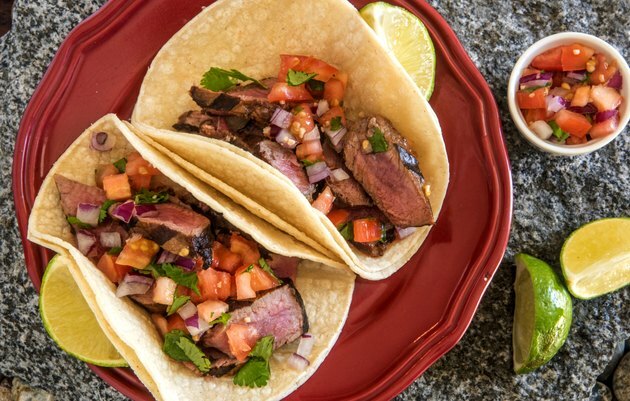 For traditional carne asada — a Latin American classic meaning "grilled meat" — purchase skirt steak or flank steak. They're not the most tender cuts, but they're brimming with rich flavor that holds its own with spiciness and other strong accompanying ingredients. Preparation begins with marination to impart some kick, but you get to tailor it to taste when making fajitas or other dishes at home, of course. Grilling only takes a matter of minutes. Prepare a marinade in a ceramic, glass, stainless steel or other nonreactive dish. Mix equal parts lime juice and cooking oil as the foundation -- use enough to submerse the beef -- then put in a liberal amount of salt and pepper. Add a spicy chili pepper powder or two to taste for heat. Then, stir in other flavoring agents as desired. Lime zest, minced garlic, oregano, cumin, onion powder, chopped cilantro and a splash of beer are suitable inclusions. Remove the meat from the marinade about 1 hour before cooking time. Let it dry and come to room temperature on a plate to promote even cooking. Throw the marinade away, as it's been contaminated by raw beef. Clean the grill and grease it with nonstick spray, then preheat to high heat in the last 20 minutes or so of this resting period. Lay the steak on the grill. Cook skirt steak for about 3 to 4 minutes per side or flank steak for about 4 to 5 minutes per side for medium. The outside should be nicely browned while the inside should remain pink and juicy. The USDA recommends cooking beef to an internal temperature of 145 degrees Fahrenheit. Warm tortillas on the grill for about 10 seconds per side.